Tuesday, July 6th was the First Ever Ladies Sailing Night at the Charlottetown Yacht Club hosted by Waveskills and the Charlottetown Yacht Club. 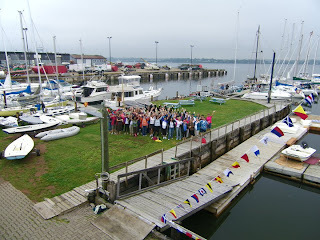 Almost twenty boats and about 75 women, with varied sailing experience, participated. Obsession was the only boat not from the CYC, though it had been berthed there for many years with its previous owner. The night was designed to expose more women to sailing. Some of the participants had lots of experience, while others had never been on a sailboat before. Here is the group photo from the Waveskills Facebook Page taken just before we headed out. Jay and I had the pleasure of taking two women out with us for a two hour sail in the Charlottetown Harbour, one of whom was a reporter with CBC Radio. The day had been rainy and overcast, but although it was a cloudy evening the rain held off. The wind was very light, so we ghosted along at a maximum speed of 3.5 knots. Some of the boats put up spinnakers, but we were too busy making chocolate chip cookies in the oven and chatting with our guests to bother with the spinnaker. After the sail, we all gathered in the Treehouse Restaurant at CYC for some live music, munchies and door prizes. It was a great night. CBC Radio Island Morning covered the event and the piece is to air during Charlottetown Race Week on Thursday, July 15th. That sounds like a great day - I'll be tuned in for the radio coverage! Purchasing a yacht is for sure a major investment and an enjoyable experience. By taking essential care you can make this procedure reasonably secure, leading to a positive decision.